In the SILIKA research and training program we will focus on the antenna-system part of base stations, including radiating elements, transmit and receive electronics (ICs) and beamforming digital signal processing. The design of such complex antenna systems requires international cooperation of several disciplines, including radiating element design, high-frequency IC design and manufacturing, packaging, signal processing algorithms and expertise on antenna system architectures. SILIKA will provide a virtual research team from leading R&D labs in this domain from European industries and universities. The consortium is complemented by leading research institutes in the domain of radio-astronomy (ASTRON) and phased-array radar (TNO). The consortium will unite their research efforts to solve the challenges with a total of 12 early-stage researchers (ESRs). The program will strongly enhance the employability and career prospects of the ESRs by offering a high-quality consortium with in-depth training in the area of co-design of mm-wave multi-antenna massive MIMO base stations with silicon-based electronics and will equip them with a comprehensive set of transferable skills relevant for innovation and long-term employability. The research fellows will spend at least 50% of their time at industry, ensuring that the training includes a significant industrial experience and application know-how. SILIKA will focus on solving the societal challenges (SC) and technology challenges (TC) as shown in the figure below. The SC and TC result in five research lines (RL) which will be addressed within the context of the SILIKA research and training program. A more detailed description of the SCs, TCs and the associated RLs is provided below. SC1: Facilitate cost-effective and reliable high-data rate wireless communication: Wireless communication is by far the fastest growing technology worldwide. In 2020, it is expected that 70 percent of the world’s population will have at least one smartphone. New applications will emerge such as Machine-to-Machine communication and medical applications to increase care quality and comfort of patients. Therefore, higher data rates are required, and as a consequence, higher frequencies such as the mm-wave band. Although several professional domains (e.g. defence and radio-astronomy) have used mm-wave antenna systems, these systems typically require a long development time, are costly and power-hungry and are therefore not competitive for the commercial wireless infrastructure market. The SILIKA program aims to overcome the technological and economical cost barriers by creating a team of new experts to work in competitive multi-disciplinary teams. SC2: Relieve the shortage of well-qualified experts in wireless infrastructure and increase innovation potential: Europe has a leading position in the domain of wireless infrastructure. In order to maintain this position, it is key to train new experts in the mm-wave wireless infrastructure domain. 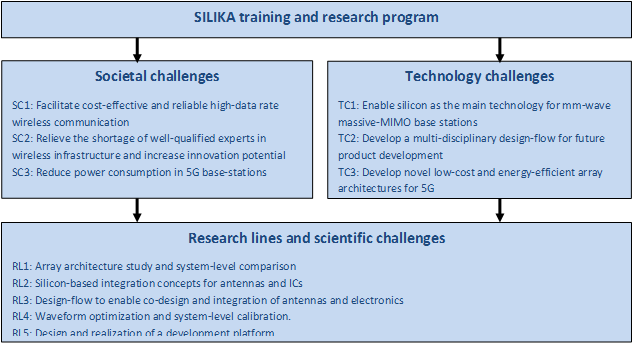 In SILIKA, we have the unique combination of leading semiconductor industry and wireless infrastructure industry, ensuring a multi-disciplinary training of a team of new experts. SC3: Reduce power consumption in 5G base-stations: Already in 2008 it was estimated that each year 2.5 GW additional power is required to facilitate the growth in the number of installed base stations. Existing base stations operate at frequencies below 4 GHz, with quite good power efficiencies of the RF transmitter, about 60-70%. At mm-waves, new power-efficient concepts have to be developed, based on air cooling. In SILIKA we will focus on innovative concepts that minimize power consumption. TC1: Enable silicon as the main technology for mm-wave massive-MIMO base stations: During the last decade we have seen a breakthrough in silicon IC technologies (CMOS and SiGe BiCMOS). State-of-the-art technologies have transit frequencies well above 200 GHz. Until recently, this performance could only be achieved with expensive GaAs/GaN-based processes. Therefore, silicon technologies allow to integrate mm-wave transmit and receive electronics with digital electronics, resulting in powerful and cost-effective solutions. In order to enable silicon for mm-waves it is essential to develop new IP blocks and co-design concepts that facilitate the integration of the IC-package and radiating elements. TC2: Develop a multi-disciplinary design-flow for future product development: For mm-wave product development, a multi-disciplinary design approach is essential, since the signal-processing, electronics, packaging and antenna are integrated in a single compact physical structure. While the traditional academic groups teach the above field as independent disciplines, design teams work separately and communicate on the basis of sub-system or component specifications. In SILIKA, the ESRs will be trained to address the multi-disciplinary nature of mm-wave antenna systems. A design flow will be developed to facilitate the design process. TC3: Develop novel low-cost and energy efficient array architectures for 5G: Society requires energy-efficient wireless infrastructure solutions. Therefore, competitive mm-wave base stations should be power efficient and based on air cooling only. In SILIKA we will develop novel array solutions for massive MIMO both for indoor and outdoor applications. RL1: Array architecture study and system-level comparison: A system-level study is performed in projects P1 and P2 to explore which antenna-system architecture fits best with the various use-cases and propagation conditions which are expected in future mm-wave 5G wireless communication systems. Two specific implementations will be designed and experimentally verified in projects P3 and P4. RL1 will deliver requirements for RL2, RL4 and RL5 during the execution of the program. Insights obtained in P3-P12 will be used to improve the overall antenna system concept and performance. RL2: Silicon-based integration concepts for antennas and ICs: Integrated sub-arrays including transmit and receive integrated circuits (ICs), IC packaging and radiating elements are designed and realized in P3-P9. A sub-array level trade-off will be made in order to optimize the overall antenna system parameters, such as power-added efficiency, receive noise figure and scan range. The sub-arrays will be used as building blocks to realize the antenna system development platform. RL3: Design flow for co-design and integration of antennas and electronics: A novel design flow will be developed during the overall program to facilitate the multi-disciplinary design challenge of RL2. The design flow will bridge the existing gap between IC design tools, electromagnetic tools for antenna design and packaging design tools (e.g. thermal design). The projects P3-P10 will contribute and use the design flow. RL4: Waveform optimization and system-level calibration: Massive MIMO antenna systems rely on advanced signal processing techniques and accurate calibration principles. The optimal beamforming and selection of optimal waveform shape of the transmitted signals for the expected propagation conditions of the various use cases is investigated in projects P11 and P12. Goal is to optimise for highest data-rate, quality-of-service and power efficiency. An optimal way to calibrate the overall antenna system in varying propagation conditions is studied in P10. RL5: Design and realization of a development platform: Due to the multi-disciplinary approach of the SILIKA program, the creation of a system-level development platform is crucial. This antenna-system platform will be used to study the performance in real-world use-cases for mm-wave 5G base stations. The integrated concepts from P5-P9 will be used in P3 and P4 to realize the front-end of the antenna system. The signal-processing concepts of P10-P12, which will be implemented on a digital FPGA solution, complement the front-end hardware to form a massive-MIMO antenna development platform. The platform will be used to verify the base station performance for various use cases as defined in P1 and P2 using over-the-air testing by emulating a virtual radio environment, which reproduces the essential features of realistic propagation conditions as closely as possible using reproducible conditions. The development platform will be built using the prototype hardware and algorithms developed within SILIKA, complemented with existing hardware available within the SILIKA consortium. Copyright © 2012 DigiTec. All Rights Reserved.